After taking the title as one of the best beer festivals in the world, Mikkeller’s Copenhagen Beer Celebration (CBC) first came to the U.S. and took over Boston’s City Plaza one year ago. Sure, there were a few kinks to work out on night one, year one, but by the final session, CBC had pulled off a successful music and beer festival on their first try. So, how could Mikkeller improve for year two? A new perspective thanks to their move from City Plaza to the SoWa Power Station, to start. Plus a new atmosphere as brewers instead of volunteers manned their booths throughout the weekend’s three sessions, allowing for time to greet and chat with festival attendees. While recovering from the weekend, we wanted to take the time to call out some of our favorite beverages from CBC Boston. Sure, a big mead could be dangerous at a festival, but when it’s a mead from Superstition, you make an exception. 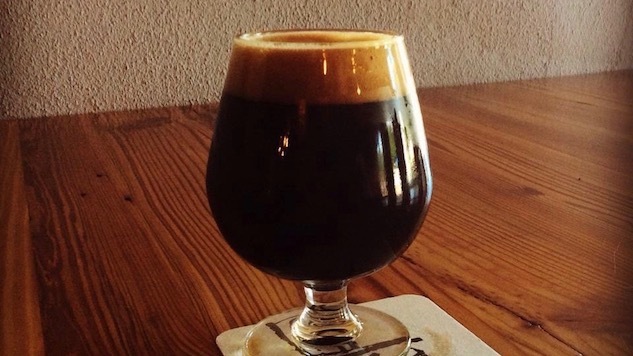 Founders Jeff and Jen Herbert came out dealing when they served for the first time barrel-aged Amante, a mead with Belgian dark candy sugar, Mostra coffee, cinnamon, cocoa nibs, and mild red Hatch chile. Last year the base mead, Amante, was included in Draft magazine’s Top 25 Beers of 2016, so seeing a barrel-aged version for the first time was certainly intriguing. “Our goal was to create a sweet breakfast mead that is able to showcase the balance between all of the adjuncts we added,” Jeff Herbert says. When you try Amante, both the regular and barrel-aged version, it’s clear that Superstition’s mission was accomplished. One of the sleepers for this year’s CBC was Frederiksdal, a winery out of southern Denmark who came prepared with several of their wines for attendees to try. For the last four years, Frederiksdal has been producing wine from sour cherries that are native to only Denmark and parts of Sweden. Sur Lie is a blend of vintages of their sour cherry wine that has been aged in French oak barrels. Sur Lie provides notes of chocolate covered cherries, and drinks similar to a mead with a little less sweetness. If you can find yourself a bottle or two of Frederiksdal at your local store in the states, we highly recommend it! One of the sure things going into CBC this year was that Bokkereyder would once again be the prettiest girl at the dance. After their debut last year, which was followed by winning the award for “Best New Brewery” from Rate Beer Best, we knew the line wouldn’t be short. Starting right from the VIP session on Friday night, beer lovers took advantage of one of the few times they would be able to try Founder Raf Souvereyns blends. While it was Raf’s fruited blends that wowed us last year, this year it was his non-fruited blends such as Oloroso that showcased his versatility. Oloroso is blend of Lambic aged in Oloroso Sherry barrels from Spain that gives off a funky cheese aroma followed by an incredible interplay of funk and Sherry barrel character. One of the festival’s newcomers came prepared to their first CBC Boston suited-up and ready to go with their patented board shorts, flip flops, and most importantly, several incredible brews. While their iconic Black Magick variants and Aussie IPA were tasting on-point, it was their Imperial Breakfast Stout (IBS), a beer from this year’s Barrel Room Collection series, that was the winner for us. IBS is an homage to one of head brewer Curt Rachocki’s favorite beers, Founders Breakfast Stout. While the adjuncts are certainly present, IBS is able to find that middle ground, giving off just the right amount of maple and coffee that finishes with that big barrel character that has become a staple in Voodoo’s beers. One of the bigger lines for this weekend’s festivities was for The Veil, and rightfully so. The relatively new brewery out of Richmond has been catching the eye of hop-heads throughout the country. This weekend however, it wasn’t their hops that caught our attention, but their fruited Gose, which luckily for us, poured at all three sessions. Never Never Aloha Aloha, is a Hawaiian Punch inspired Gose, brewed with Hawaiian red alaea sea salt and conditioned on pineapple, mango, passion fruit, blood orange, guava, and cherry purée. Yes you read that correctly, a Hawaiian Punch inspired Gose, and they absolutely nailed the flavor. We’re sure The Veil will continue to be known mostly for their hops (for now at least), but it’s their ability to brew beers like this that has them releasing some of, if not the best fruited Gose beers in the country right now. Founder and head brewer Chris Betts brought a surprise for those that attended session two: Kentuckley, an Imperial Breakfast Stout aged for a year in bourbon barrels. While we were familiar with Chris’ hoppy brews, which were featured in our Haze Craze article, we were happy to see one of his stouts, having known Chris’ background. For those of you who aren’t as familiar, prior to Transient, Chris was a brewer at Witch’s Hat Brewing Co., where he brewed their first batch of the Night Fury set, a set that brought all the beer traders to the yard when it first came out. Getting back to Kentuckley, the beer provides a big coffee presence with a hint of maple to cut any harshness, and it’s rounded out with a smooth barrel character that gives of no hint of booze. Look for a new batch of Kentuckley early next year, along with a variant aged in maple syrup barrels. Bottle Logic caught the beer world’s attention when they released their first batch of Fundamental Observation (FO) in 2015, a barrel-aged stout, blended with Madagascar vanilla beans. When it comes to beer nerds today, the phrase “this is not as good as batch one,” is used way too often, however, batch three of FO might actually be Bottle Logic’s best batch. Batch three provides that huge vanilla aroma we fell in-love with when we first tried batch one years ago, just with a little less of that motor oil consistency. Following that aroma, you get the taste of oak character and milk chocolate. The crazy thing is that unlike batch one, you could probably find someone to share theirs with you without having to provide your first-born son. Head brewer Derek Gallanosa surprised festival attendees with a keg of barrel-aged M3, a collaboration with Corey Artanis from 3 Sons Brewing Company. While regular M3 was aged on several adjuncts including vanilla and coffee, it’s the cocoa nibs that take center stage, creating a total fudge bomb. For the barrel-aged version, Derek decided to treat the beer slightly different. Since the base beer already has a lot of chocolate flavor, Derek chose to increase the time and amount of vanilla and coffee he added to the beer, to allow these adjuncts a chance to shine. Angry Chair has continued to release hit after hit of variants of their Imperial Sweet Stout. Last year it was German Chocolate Cake that made it into our top ten, and this year it was Woke. As you can imagine with a name like Woke, this is a breakfast stout, blended with maple and coffee. What we like the most about Angry Chair’s sweet stout variants is their ability to integrate adjuncts into the base beer. Sure they might fall into the category of being “pastry stouts,” but they’re meant to be fun to drink, and at the end of the day, they are just so damn good, and enjoyable that you shouldn’t pass up the opportunity try them. In 2016 Jester King introduced us to Spon, a beer took almost four years to release. The inspiration for Spon came from a trip back in 2012 when Jester King visited Belgium’s famous Brasserie Cantillon. When Jester King returned to the states, they set out on a mission to brew a 100% spontaneously fermented Lambic inspired beer, following the traditional brewing methods. The Mourvedre & Sangiovese variant blends two-year old Spon and three-year old Spon. This blend was then aged on Mourvedre grapes from Texas and Sangiovese from Colorado, and was packaged a year before it was released on September 22nd, creating a funky enjoyable blend that needs to be explored.